Surgeons, hospitals and patients typically are all on the same page when it comes to going into the operating room (OR): the less invasive the surgery, the faster the healing process. One tool that frequently comes into play on the operating table—the endoscope—is getting an IoT assist. The endoscope is what makes it possible to monitor and guide specific, robotic instruments used for minimally invasive surgical procedures. In turn, it is dependent upon the monitoring equipment installed in the OR. Although federal regulations enforce minimum standards for equipment safety, when it comes to the sharpness of the images produced and the simplicity of the system’s operation, that varies from hospital to hospital and even OR to OR. IoT technologies are improving the situation by ensuring that high-resolution surgical images are automatically saved—often to a secure cloud location that can be accessed from wherever, whenever needed. 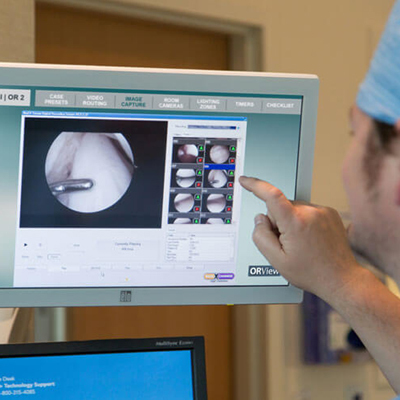 Southwest Surgical Center, an orthopedic medical clinic in Edina, MN, that provides arthroscopic joint repair and other surgical services, depends on endoscopic technologies in a big way. The devices support the centers commitment to minimally invasive procedures. Outstanding video for the center’s surgeons and simplified video routing and control for OR staff during procedures is a necessity, and the team wanted a superior solution to replace its current technology. Diversified, a technology integration partner based in Kenilworth, NJ, with deep experience in custom-designed video systems for operating rooms, was tapped by the surgical center to provide the superior video quality and simplified video routing and system control it sought. The integrator’s solution included custom software, medical-grade LCD displays and the hardware to attach the displays to the client’s overhead boom system, a control system, and transport and switching. To make long surgeries more pleasant for the staff and surgeons, the solution also included a high-quality sound system. Diversified selected software features that were the most useful in a surgical environment. The result was an extremely flexible system, one easily scaled and customized to the specifications of each surgeon and surgery, providing the ability to quickly turn features on and off and choose the most appropriate hardware with ease. To ensure even further flexibility, the Diversified solution’s digital network technology is scalable as well, enabling adjustments to the size of the control processor, switcher and other components with little or no change to the software. To meet Southwest Surgical’s goals, Diversified installed a Crestron DigitalMedia (DM) network with a 16×16 switcher, a medical-grade monitor for the surgeon’s use, another for the nurses’ use and a video capture device to record images from the procedure. A nurse controls the video system and the room lighting using a 19” medical grade touch screen tied into a Crestron control processor. CompView, a Diversified company, also installed four auxiliary wall plates, so the surgical team can plug in specialized instruments that may not already be installed in the overhead boom. One of the drivers for choosing Crestron DigitalMedia (DM) technology for the solution was that the majority of hospitals and clinics tend to have a lot of legacy instruments that may have SDI, S-video or even composite video outputs. “DM allows us to connect any medical instrument with a video output and provide the best possible images,” said Rodger De George, VP of Business Development for Medical Systems at Diversified. In addition, the twisted-pair network cable standard to DM is easy to install in the limited space in an operating room equipment boom. Its ability to transport and switch high-end audio was a big plus in its favor as well. Diversified programmed the system so that when the team captures an image from the endoscope, it appears briefly, picture-in-picture on the surgeon’s monitor to confirm what was captured. Next, it is saved automatically to the clinic’s PAC [Picture/Archive/Communications] system to become part of the patient’s record. Learn more about Diversified solutions that count on connected IoT technology, such as audio visual tools and managed services. See other healthcare technologies from Diversified, including simulation lab designs and interactive video walls for hospitals.